At our KK Dive Shop: the PADI pyramid of diver education! Home/Courses, Dive Shop, News/At our KK Dive Shop: the PADI pyramid of diver education! Supervisor Karen has assembled an awesome structure of the PADI pyramid of diver education at our KK Dive Shop. 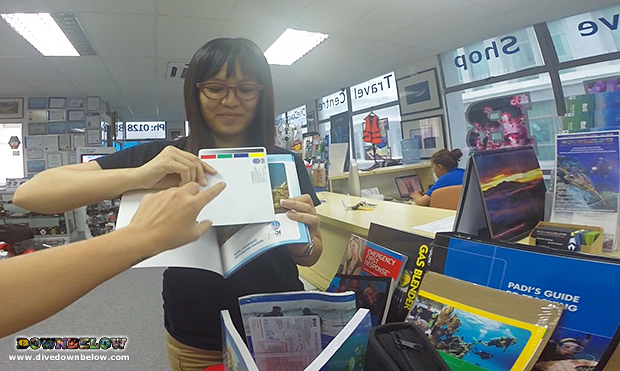 This pyramid of educational materials can be read by our walk-in clients and visitors to our KK Times Square HQ for a better understanding of the variety of PADI diving courses and programs. If you’re thinking to Go PRO, on display is the PADI Instructor Manual, which comes in its own zipped binder for any candidate on our professional scuba diving internship program. Our Dive Shop is the same location as our Sabah Travel Centre, which is really handy for clients who will be visiting our premier PADI 5 Star IDC Dive Centre in Tunku Abdul Rahman marine park. Guests can finalize their itinerary to include an island activity with one of our travel consultants and leave with the educational materials corresponding to their PADI course and start their studies ASAP. Get more details on what PADI courses and programs we conduct at our beach house and the dive theory study to meet its performance requirements, when you contact our Kota Kinabalu Head Office! By Joanne Swann|2015-01-22T09:22:08+08:00January 23rd, 2015|Courses, Dive Shop, News|Comments Off on At our KK Dive Shop: the PADI pyramid of diver education!